Expand your business opportunities with Contex’s versatile HD5450 scanner featuring advanced technology and quality imaging for color and monochrome scanning. The large 54” imaging area is designed to facilitate archival and reprographic tasks with a wide variety of large technical documents, detailed maps and drawings, or color posters and architectural sketches – all at the highest resolution and speed. You get exceptional professional-grade performance with 508dpi optical resolution with speeds of up to 12 inch/second. With uncompromising image quality standards, the Contex HD5450 scanner is designed for high-volume productivity for businesses-critical imaging tasks. Whether you are a private business, government or print-for-pay, Contex’s range of HD scanners is the right solution for improved efficiency and productivity. This is a sizable scanner with a sensitive side. Featuring our advanced imaging technology, it's the ultimate With 508dpi optical resolution, the combination of highly sensitive 4-channel CCD cameras and full-sized high-quality camera lenses, the HD5450 scanner provide the best image quality available in wide format scanning. With image processing performed inside the scanner, your PC is free to run software applications more efficiently. Despite its huge 54” imaging area, the Contex HD5450 delicately handles oversized drawings, posters, architectural sketches, detailed maps, even fine art – reproducing quality images, fast. And it’s unbeatable on resolution, delivering the industry’s best at 120,000 pixels. You can rely on the Contex HD5450 for consistently outstanding extra-wide format scanning results. With 508dpi optical resolution, the combination of highly sensitive 4-channel CCD cameras and full-sized high-quality camera lenses, the HD5450 scanner provide the best image quality available in wide format scanning. With image processing performed inside the scanner, your PC is free to run software applications more efficiently. 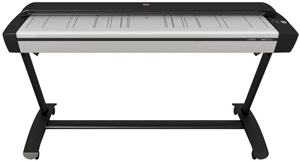 The Contex HD5450 wide format scanner is among the fastest in the business with up to 12 inch/second scanning speeds. Truly a workhorse that can handle very large originals with speed and ease. When you want productivity and reliability, the HD5450 scanner gives you the best performance and the highest return on your investment. Optical Adjustment Pattern, 54", 4 Cam. Original Guide Plate, complete, 54"
Standard Warranty: 24 month onsite. Distributor invoiced at time of registration. Must be registered within 30 days of sale. pre-existing onsite warranty expires, includes renewals. expired and the end-user desires to purchase a onsite warranty.